Railpictures.ca - John Pittman Photo: Eastbound CN doublestack container train 148 is a colourful sight as it sweeps around the S-curve at the west end of the Bayview Junction wye, approaching the Oakville Sub. Autumn colours are just starting to appear. In the lead is GMDD SD75i CN 5697, with ex-CSX GE Dash 8-40CW lease units GECX 7353 and GECX 9142 following. GECX 7353 has minimal patching; original CSX unit number with GECX stenciled below and a black line through CSX. GECX 9142 is more heavily redacted; different unit number and number boards, CSX totally blacked out. Looks like the black paint over CSX and the cabside number was applied with a paint roller. | Railpictures.ca – Canadian Railway Photography – photographie ferroviaire Canadienne. 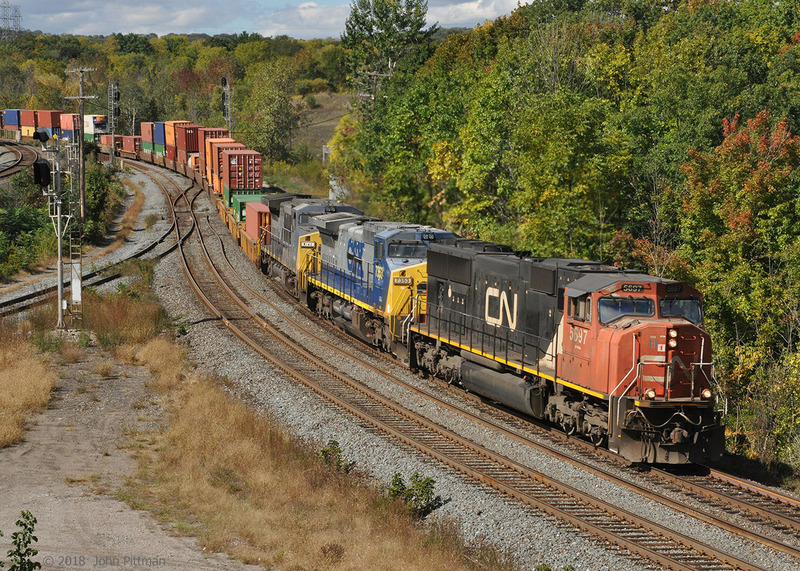 Caption: Eastbound CN doublestack container train 148 is a colourful sight as it sweeps around the S-curve at the west end of the Bayview Junction wye, approaching the Oakville Sub. Autumn colours are just starting to appear. In the lead is GMDD SD75i CN 5697, with ex-CSX GE Dash 8-40CW lease units GECX 7353 and GECX 9142 following. GECX 7353 has minimal patching; original CSX unit number with GECX stenciled below and a black line through CSX. GECX 9142 is more heavily redacted; different unit number and number boards, CSX totally blacked out. Looks like the black paint over CSX and the cabside number was applied with a paint roller.